I am a huge advocate of the healing effects of LED light on the skin. LED light therapy works by using four specific wavelengths of visible light (red, yellow, green and blue) to treat blemishes, uneven skin tones, redness, inflammation and sun damage. This powerful tool can be used as a stand alone treatment on clean skin, or in concert with light activated serums and masks to boost healing. So many of us love the sun, but understand that the ultraviolet rays of the sun are damaging to the skin. The LED spectrum of visible light is the non-invasive therapeutic light that we all crave when we worship the sun. What do the different colors do? Each color of light has its own benefits to the skin. The red lights are great for energizing every cell which makes it a must-have technology for skin rejuvenation. Yellow is the color of choice for decreasing inflammation by encouraging circulation and boosting the body's immune system. Green light on the skin has shown to target uneven skin tones and reduce redness. Blue LED light has long be recognized as the non-invasive gentle therapy of choice for acne blemishes because of its ability to kill the acne bacteria in the pore with just light! Studies show that skin exposed to LED light wavelengths grows 150- 200% faster. Therefore, as LED therapy improves the cosmetic appearance of skin, it also promotes the healing of wounds, scars and burns. This happens because skin has a high blood and water content, so it quickly absorbs the visible light to produce enough energy to cause a healing response from the body. Are you plagued with acne but sensitive to the standard therapies of benzoyl peroxide or retin-a products? Has your Doctor suggested Accutane? Rather than risk the potentially debilitating side effects of the toxic levels of Vitamin A in Accutane, why not choose a safe, non-toxic skin repairing alternative? There are at least seven different causes of acne and no known cure. 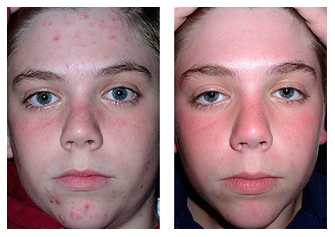 Acne needs to be managed on a case by case basis. What works for one does not apply to everyone. LED light therapy combats acne on many levels: it calms the inflammatory response of the body, it kills acne bacteria deep in the pore with blue light, it combats hyperpigmentation (red spots that seem to last for weeks, even months) and it stimulates the body to make new healthy skin.